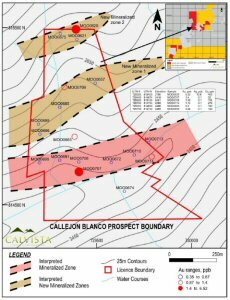 Calvista Gold Corporation (TSX:CVZ)(OTCQX:CAGOF) ("Calvista" or the "Company") is pleased to announce that its recent soil sampling program has identified two new mineralized zones at the Company's Callejón Blanco prospect within its wholly-owned California Valley Project ("the Project"). The Company's Chief Executive Officer, Mr. Mark Haywood, stated that "the exciting discovery of two new mineralized zones parallel to our previously discovered zones on the La Mascota ore zone represent major exploration targets for Calvista. Further exploration under our upcoming Phase III diamond drilling program will have the potential to significantly increase our mineral resources at the Callejón Blanco prospect." Under the Company's soil sampling campaign, all Calvista's licenses were sampled on a 100 x 50 metre GPS grid using the company's codified card system. A total of 351 samples were taken from the upper part of the B Horizon and assayed using Enzyme leach technology by Activation laboratories in Canada. Figure 1 highlights the two new interpreted mineralized zones at the Callejón Blanco prospect. Table 1 in Appendix A also shows selected results from the Company's soil sampling campaign. Additional magnetic susceptibility and temperature surveys were completed and integrated into the interpretation of the targets. Geochemical results were processed using Compositional Data Analysis and other statistical methods such as Factor Analysis and Correlation Studies. As the result of these studies, new target zones were identified and drilling targets were selected for Calvista's Phase III drilling campaign. To view "Figure 1. 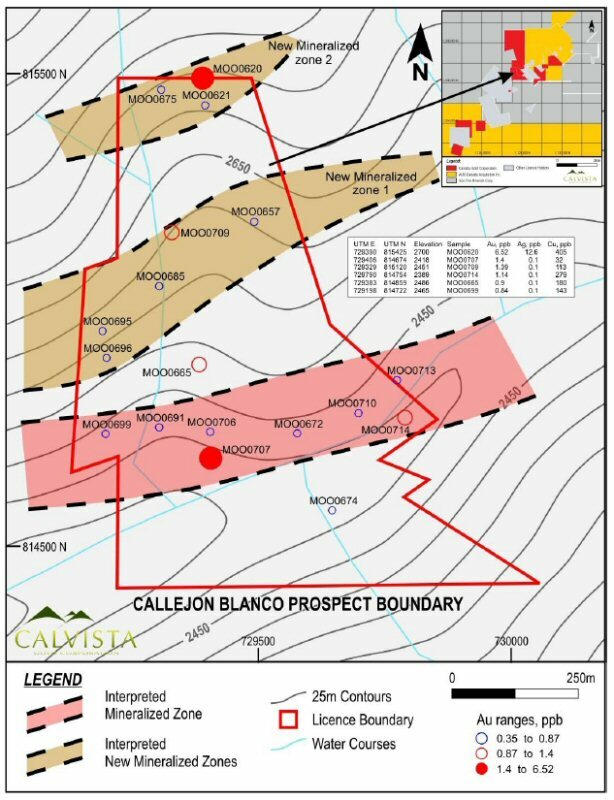 New Interpreted Mineralized Zones", please visit the following link: http://www.marketwire.com/library/20120911-CallejonBlanco800.jpg. Calvista has developed and implemented Quality Assurance/Quality Control protocols that exceeds current industry best practices. Calvista's exploration protocol includes the insertion of blanks, duplicates, standards and external controls on all their samples. Samples with assay results greater than 10 g/t Au are re -assayed by metallic screen analysis. Sample preparation is conducted by the ALS Group ("ALS") in Bucaramanga, Colombia before being analyzed at the ALS certified assay laboratory in Lima, Peru. Mr. Ricardo Valls, P. Geo., Calvista's VP Exploration, is the Company's designated Qualified Person for this press release within the meaning of National Instrument 43-101 Standards of Disclosure for Mineral Projects and has reviewed and validated that the technical information contained in the release is accurate. Calvista is a mineral exploration company focused on the acquisition, exploration and development of properties for the mining of gold and other minerals. All our prospects in the California Valley are located below 3,200 metres and are not affected by the Paramo ecosystem law. With a head office in Toronto and Colombian headquarters in Bucaramanga, Calvista is led by a management team with over 50 years of exploration and mining experience, principally in South and Central America. For further details on Calvista, please refer to our web site (www.calvistagold.com) and Calvista's Canadian regulatory filings on SEDAR at www.sedar.com. CAUTIONARY STATEMENT: This news release contains forward-looking information, which is not comprised of historical facts. Forward-looking information involves risks, uncertainties and other factors that could cause actual events, results, performance, prospects and opportunities to differ materially from those expressed or implied by such forward-looking information. Forward looking information in this news release includes, but is not limited to, Calvista's objectives, goals or future plans, statements regarding exploration results, exploration plans and the timing of a potential resource estimate. Factors that could cause actual results to differ materially from such forward-looking information include, but are not limited to, uncertainties inherent to preparing a resource estimate within expected timeline, capital and operating costs varying significantly from estimates, the preliminary nature of metallurgical test results, delays in obtaining or failures to obtain required governmental, environmental or other project approvals, political risks, uncertainties relating to the availability and costs of financing needed in the future, changes in equity markets, inflation, changes in exchange rates, fluctuations in commodity prices, delays in the development of projects and the other risks involved in the mineral exploration and development industry, enhanced risks inherent to conducting business in a jurisdiction such as Colombia, and those risks set out in Calvista's public documents filed on SEDAR. Although Calvista believes that the assumptions and factors used in preparing the forward-looking information in this news release are reasonable, undue reliance should not be placed on such information, which only applies as of the date of this news release, and no assurance can be given that such events will occur in the disclosed time frames or at all. Calvista disclaims any intention or obligation to update or revise any forward-looking information, whether as a result of new information, future events or otherwise, other than as required by law. The Toronto Stock Exchange does not accept responsibility for the adequacy or accuracy of this release. No stock exchange, securities commission or other regulatory authority has approved or disapproved the information contained herein. Figure 1. New Interpreted Mineralized Zones.